Landing on a planet hundreds of millions of miles away from Earth is incredibly challenging. The surface of Mars has many hazards. There are deep canyons, volcanic mountains and craters of all sizes formed by meteorite impact. Some areas are strewn with boulders; others are shrouded in sand dunes. In addition, landers must rapidly decelerate from 13,000 miles per hour in a matter of minutes. Landers therefore need systems to ensure a safe landing. For example, Mars Pathfinder and the Mars Exploration Rovers both airbag landing systems. When hitting the surface, the lander is protected inside something that looks like a huge, bouncing ball. Future landers using airbags might include new technologies that would prevent the "ball" from rolling down steep terrain once it lands. Another new landing gear design would use a structure that acts as a shock absorber to protect the main body of the lander. This shock absorber would also have legs to help stabilize the craft upon landing. Both the shock absorber and legs could crumble or be destroyed without jeopardizing the main lander. Even better than mere protective systems, "smart landers" of the future will be able to achieve safe landings by scanning the terrain about half-a-mile above the surface and guiding themselves to much smaller target zones--down to a few hundred feet in size. Then, they will be able to dodge large hazards like boulders and crevices at the very last moment. In case they aren't aware of last-minute hazards, these landers will carry impact protection systems that will be lighter than those on our present landers. These sophisticated approaches to landing safely will also allow future landers to carry more equipment. 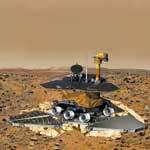 This greater "load" capability will enable missions that are not feasible with current technology, such as sample returns of rock and soil to Earth or heavy drilling equipment for exploring deep beneath the Martian surface in a search for liquid water and possible past or present signs of life.